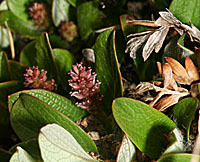 Snow Willow, Salix nivalis, growing on alpine tundra on Pikes Peak, Colorado, elevation 12,900 Feet, June 16, 2007. 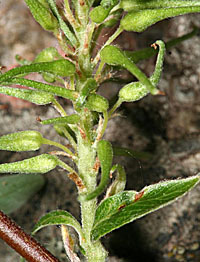 Plant height is 15 mm. 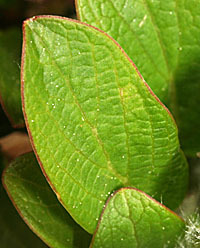 , leaf length is 15 mm, leaf width 7 mm, inflorescence (male) width 4 mm. 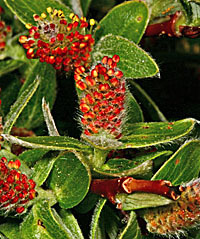 This is a dwarf willow of alpine tundra. 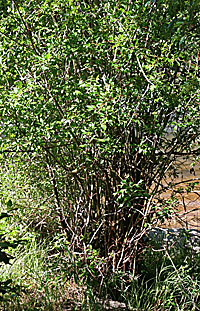 Bebb Willow, Salix bebbiana, growing next to stream at Granite Campground,Taylor creek just upstream of Almont, Colorado, elevation 8,400 feet, July 23, 2007. 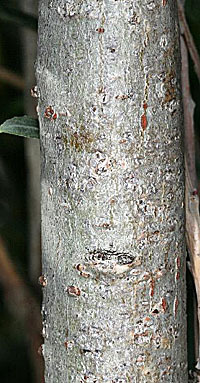 Trunks all in a bunch. 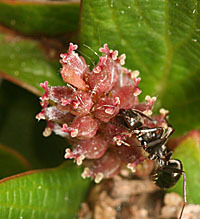 height 4 meters. 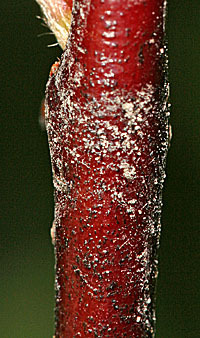 twigs red, stems gray, trunksgreenish yellow. leaves alt l 45 mm, w 21 mm. 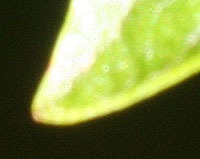 Small red gland at leaf tips. 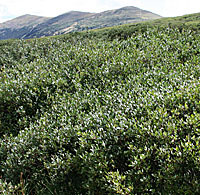 Salix brachicarpa, Short Fruited Willow, growing in marshes just east of Guanella Pass, Colorado. 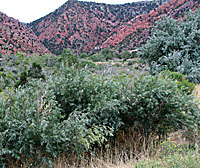 Elevation is 11,500 feet, August 19, 2006. 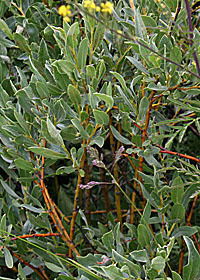 Blue willow, Salix drummondiana, growing where a small stream crosses a road in Gothic, Colorado, elevation 9,400 Feet, July 22, 2007. 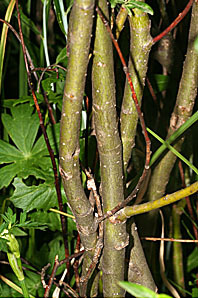 This is a larger willow, height 4 meters, trunk to 4.5 cm diameter, leaf length 70 mm, width 35 mm. 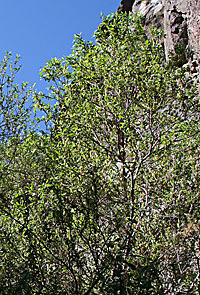 Green twigs have glacous bloom. 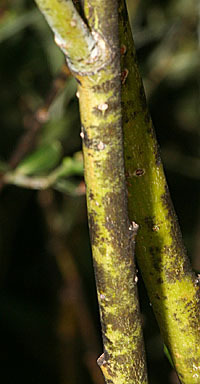 Stems are greenish yellow, trunks grey. 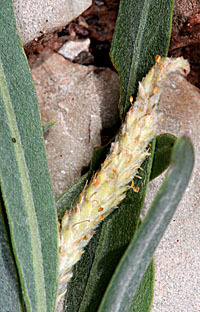 Leaves bright green on top with felty hairs on the bottom. 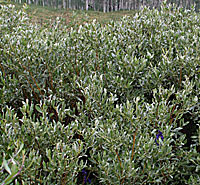 Geyers willow, Salix geyeriana, growing in a moist meadow at Rocky Mountain Biological Laboratory, Gothic, Colorado,elevation 9,400 Feet, July 22, 2007. 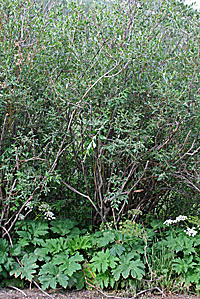 A Taller willow growing in association with wolf willow. 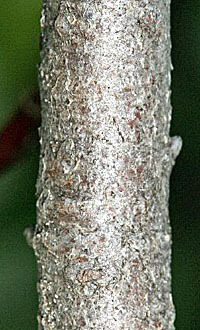 Height is 2 meters, twigs with glacous coating. 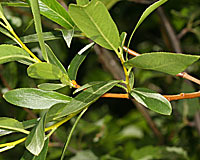 Mid sized branches greenish yellow with blackish patches. 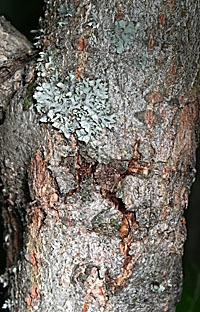 Lower trunks greenish gray. 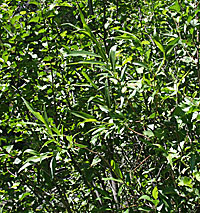 Leaves alternate length 64 mm, width 15 mm. 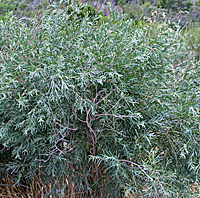 Bluestem Willow, Salix irrorata, growing by Tajique Campground, elevation 6,800 Feet, east side of the Manzano Mountains, New Mexico. 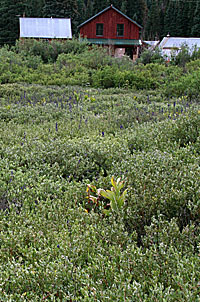 Growing adjacent to the stream by the campground on March 29, 2007. 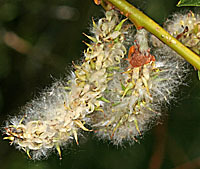 Many stems, height is ten to twelve feet, old leaves, with 6 mm pediole, length 72 mm, width < 10mm, leaves alternate, catkins appearing but no new leaves yet, female catkins green and fuzzy, length 15mm, width 6 mm, male catkins length 21 mm, w 9mm. 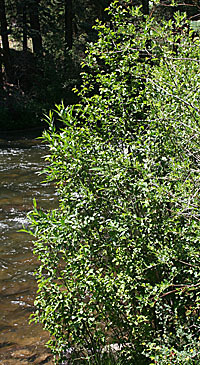 Salix lucida, a streamside willow growing on Taylor Creek upstream from Almont, Colorado, elevation 10,400 Feet, July 7, 2007. 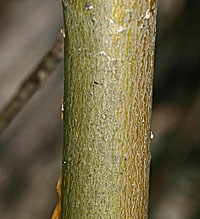 Bark is distinctly yellow green,height at least 9 feet, leaves alternate length 105 mm, width 34 mm, catkins 50 mm long, 14 mm wide. 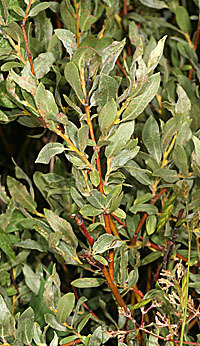 New growth 80 mm not including leaf length. 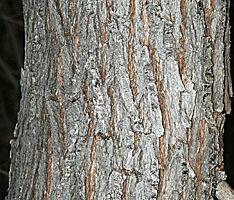 Bark color ranges from greenish yellow on twigs to greenish yellow on stems to gray with a touch of greenish yellow on trunks. 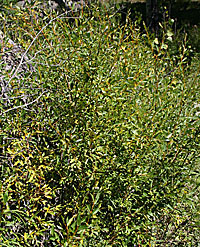 Yellow Willow, Salix lutea, gwowing low on a south facing slope at the headwaters of Monument Creek, Rampart Range, west of Colorado Springs, Colorado, elevation 9,200 feet, September 3, 2007. 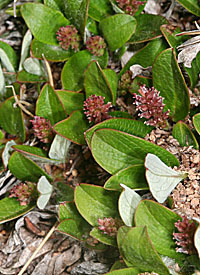 Growing in a warm microclimate adjacent to granite boulder at the north edge of the marsh with clear southern exposure. 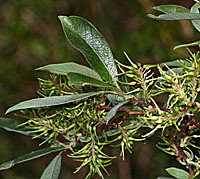 Height is 2.1 meters, twigs orange, stems gray green, trunk gray, stem leaves alternate length 50 mm, width 20 mm. 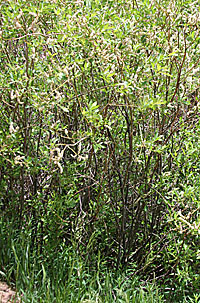 Salix petiolaris, Meadow Willow, growing in low ground along stream from Western slope inlet to Rampart Reservoir, 9,400 feet, June 21, 2006. 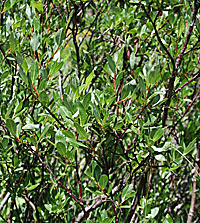 Salix planifolia, Diamondleaf Willow, shore of Summit Lake, northwest of Crested Butte, Colorado, elevation 10,400 feet, July 26, 2006. 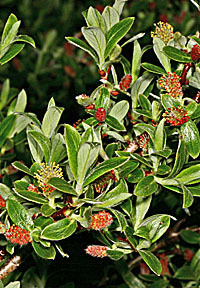 Common along lakeshore. 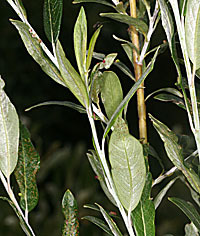 Height is about 1 meter, upper twigs reddish, lower shading to grey. 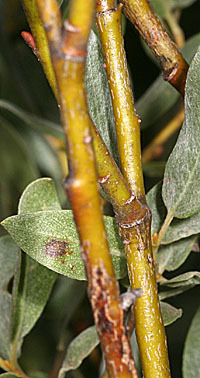 Leaves are alternate, length 38 mm. 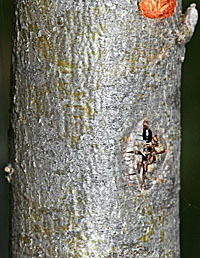 width and smooth above and below. 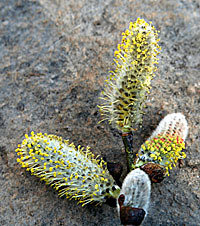 A few catkins remain. 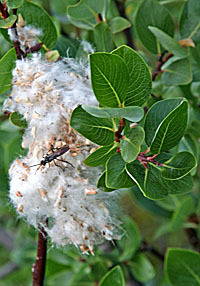 Salix serissima, Autumn Willow, growing along stream feeding Rampart Reservoir, 9,400 feet, June 21, 2006. 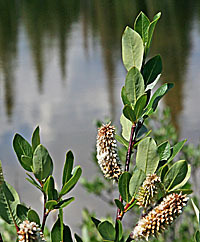 Wolf Willow, Salix wolfii, growing in a marshy meadow at Rocky Mountain Biological Laboratory, Gothic, Colorado, elevation 9,400 Feet, July 21, 2007. 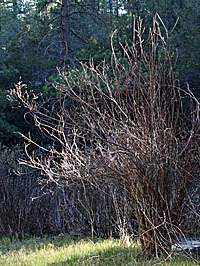 A short willow with reddish orange trunks. 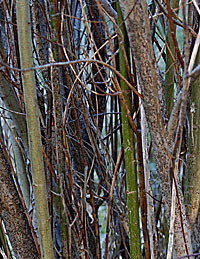 Twigs yellow orange, midsized stems yellow orange, lower bark gray green. 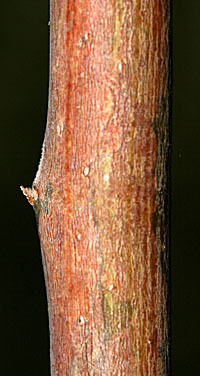 Height is 1 meter, leaves alternate, length 38 mm, width 19 mm.